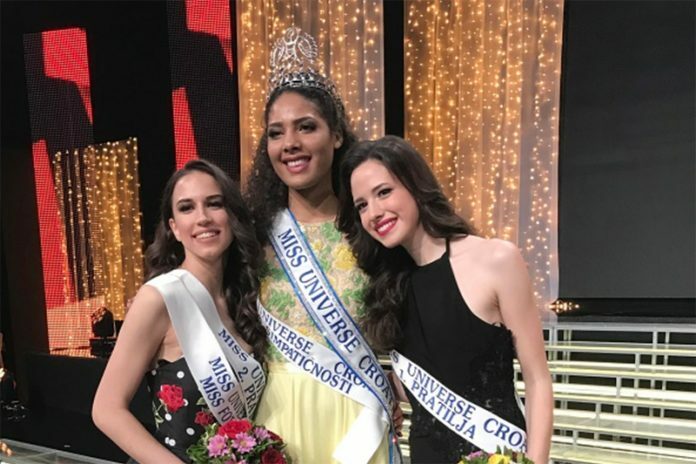 Shanaelle Petty, 19 years of age from Slavonski Brod was crowned as the new Miss Universe Croatia during a Saturday night extravaganza held in the capital city of Zagreb. Shanaelle’s father is an American while her mother is Croatian. She will represent Croatia in the Miss Universe 2017 pageant which is rumored to be held later this year. Shanaelle Petty was also awarded with Miss Photogenic title and is fluent in English as she graduated from Terey Sanford Highschool in the United States. She listed in her bio that she loves to play the piano and she is into volleyball as well. More than 300 girls across Croatia participated in this year’s quest for the new Miss Universe Croatia. Eighteen lucky girls were then chosen from the field to compete in the finals night that showcased gowns from Sherri Hill and shoes from Gimmija Baldininia. Settling for the first runner-up title is Elena Jung who hails from Vodnjan while the second runner-up is Marijana Josipović from Osijek. Marijana was named as the People’s Choice winner after garnering the most votes in the social media.